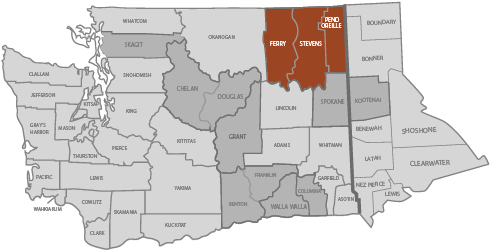 Thank you for visiting Northeast Washington Trends, an online community resource offering a centralized location to learn more about Ferry, Pend Oreille, and Stevens Counties. Approximately 130 indicators are highlighted, all are supported by trusted, reliable sources and are continually updated. These measures were chosen by residents in the three counties through a careful process and represent the preferences of what to measure from the available data. As you begin to examine the eight main categories, we hope you find the information relevant and useful in your daily work and decision-making. Enjoy your visit! Northeast Washington Trends exists to give the communities in Ferry, Pend Oreille, and Stevens Counties a way to assess how they are doing in key quality-of-life areas, such as education, health, and the environment. The Trends also seeks to improve local, public decision making by providing relevant data in an easily navigable website. The data are offered as neutral information for all parties involved in public policy issues. spectrum of information to support informed decision making by individual community members, governmental policy makers, non-governmental organizations, businesses, researchers and the press. To benchmark the Northeast Washington Trends against Washington State trends or other comparable communities to better understand our strengths and opportunities. Nestled in the northeast corner of Washington State, just below the Canadian Border and directly to the west of the Idaho State line are Washington's Tri-Counties: Ferry, Pend Oreille, and Stevens. Mostly rural with a combined population of just over 65,000 residents, the Tri-Counties area is surrounded by a seemingly endless number of mountains, rivers, and lakes. National Protected Areas including the Pacific Northwest National Scenic Trail, the Colville National Forest, Lake Roosevelt National Recreation Area, and portions of the Kaniksu National Forest and Little Pend Oreille National Wildlife Refuge are all located in our home, the Tri-Counties of Washington State.